DIY or Professional Firework Displays this Bonfire Night? Firework displays create magical moments at every occasion. Whether you’re setting them off in your back garden or attending an organised, public display produced by a professional company, the spectacle is guaranteed to prompt ‘Oohs’ and ‘Aahs’ from your audience. Here’s what you should be considering when choosing between lighting DIY fireworks at your own home or attending a professional display elsewhere this Bonfire Night. Can you really afford to purchase the fireworks needed to make your Bonfire Night at home memorable? Probably not. Tickets to professional displays are a much cheaper option and the display will be far bigger and much more creative. 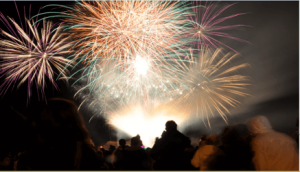 As well as the fireworks, if you choose to attend a professional display, your ticket is paying for the knowledge, safety training and vision of the company. Leading firework display companies, including the team at Entertainment Effects, often incorporate and combine fireworks with pyrotechnics, flames, illuminations and timed musical accompaniments for an event spectacular. Even better, you’ll be in a position to simply sit back and enjoy the show. And what’s more, there will be no mess to clean up afterwards! Safety should always be paramount when handling fireworks. If you’re not confident that you can store, fire and dispose of your fireworks safely, a DIY firework display definitely isn’t for you. Professional firework teams used at Bonfire Night events will have robust safety training, with tried-and-tested procedures in place for every stage of the night. They’ll also have comprehensive insurance, so event organisers can be confident that they’ll be covered should there happen to be an accident. Many venues, such as hotels and pubs, will not allow DIY displays due to insurance concerns, so if you’re unsure about any red tape issues, like permission to hold your display or safety procedures, then the professionals can take care of it all. If you want to avoid damp squibs, attending an event outside of your own home will ensure that your Bonfire Night doesn’t fall flat. 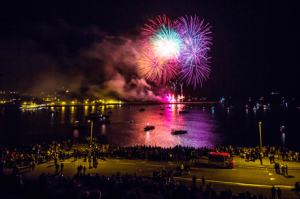 The event organisers will have hired in a professional fireworks display company who’ll know how to put on a great show whatever the weather, so you’re guaranteed an impressive night of illuminations. At Entertainment Effects, we offer professional Bonfire Night firework displays (as well as fireworks for a range of other impressive events including corporate events, private parties and anniversaries). Want your 5th of November to go off with a bang? Contact us to find out more on 01707 269 566 or email us at contactus@entertainmenteffects.co.uk.